For example, I took one of the palette of pastel colors and measured several colors with a pipette. As you can see in all this colors low saturation and high brightness. This is what makes the colors «pastel». If you want to get pastel shades, then you need to bring the image to the slightly saturated colors and make it bright enough, without strong contrasts. It will be better if you give a small toning to the whole photo. I took random image from internet and tried to make it in pastel colors. 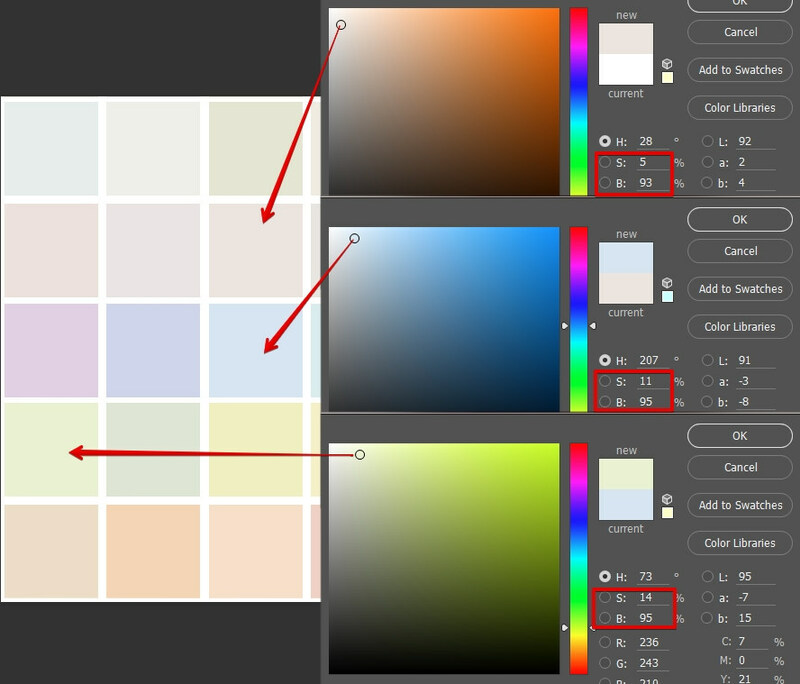 All steps to make a balanced brightness on whole photo and work with colors. And after that a bit color toning. 2 — Hue/Saturation. Red, Green, Blue colors was changed. 3 — Green channel in Lighten, 67%. 4 — Copy from previous layer part of the tree in Lighten 67%. 5 — From layer «Green Channel» was copied the road also in Lighten mode. 7 — Levels to do a color. 8 — Photo Filter to do a color. 9 — Painting on new empty layer in Color blending mode. 10 — Brighten the sky. 12 — Duplicate previous layer and change to blending mode «Soft Light», 50%. Create new layer Solid Color, in Soft Light, 35%. Group from this two layers and add a mask. It’s one of the way to do a Pastel color looks image. All what you need is analyzing what you saw. It’s for all type of color works, not only pastel looks or fashion colors of something else. Disassemble in your head the picture of the components: what do you see — colors, brightness, contrast, what colors in shadow, highlights… Analyze what you have and what you want to have. Understand the difference and change it. Also check my post about improving your skills in retouching: How to level up retouching.